Tottenham are unbeaten in their past 38 Premier League home games against promoted sides after this narrow victory against 10-man Cardiff. Everybody predicted a win for Spurs, but only 2 had it spot-on, with the other 28 getting the outcome. Lukas Jutkiewicz scored a hat-trick as Birmingham extended their unbeaten run to eight games. Nobody got this spot-on, but 22 did have the outcome. This defeat brings an end to Norwich's eight-match unbeaten run, as Stoke win away for the first time. Nobody predicted a win for Stoke. 20 predicted a win for Norwich, and the other 10 predicted a 1-1. Sunderland win a fiercely-fought match in which both teams had a player sent off, and Bradford missed a penalty. A decent 7 got this spot-on, and a further 13 had the outcome. Coventry came from behind to win with two goals in the last 10 minutes. Well done to OhOriOri for being the only one to have this spot-on, and nobody got the outcome. There were 25 who predicted a win for Charlton, with 14 going for a 2-1, in what was the weeks most predicted result. Jayden Stockley took his season's goal tally to eight with a brace as Exeter claimed a draw at Yeovil. Just the 2 got this spot-on, and another 7 had the outcome. After last weeks difficult fixtures I went for some "easier" games this week, but finding those important 3 pointers didn't prove to be much easier, and it was left to Sunderland's 2-1 win to produce more than half of the weeks total of 12 spot-ons. At least the wins for Tottenham and Birmingham guaranteed points for everybody. With nobody getting more than one 3 pointer, for the second week running we have a five-way tie for the honour of being the weeks top scorer. Those involved were burnsieespana and TheFatGooner who both had the Sunderland 2-1 spot-on, gsy163 and durham_exile who both had the Yeovil 2-2 spot-on, and finally OAFCWOOWB who had the Spurs 1-0 spot-on. They all had three outcomes to give them a decent 6 points. In the Premier By having the Sunderland 2-1 spot-on RSCOSWORTH kept up his incredible record of having at least one 3 pointer every week so far this season. His lead stays at a decent 7 points, but it is now from gsy163 whose top scoring effort reclaims the second spot he lost last week. Just the Spurs outcome for gerry_us, but he clings onto the final Charity Shield spot. Having the Spurs 1-0 spot-on moves mfb_cufc out of the relegation zone, but only 2 points separate the bottom four. In Division One Another one to benefit from having the Sunderland 2-1 spot-on was Colukev, and it enabled him to increase his lead to a very decent 8 points. He is showing no sign of relinquishing the lead he has held since Week 1. Just two outcomes for the second week running, but oxfcolu still remains in the other automatic spot. 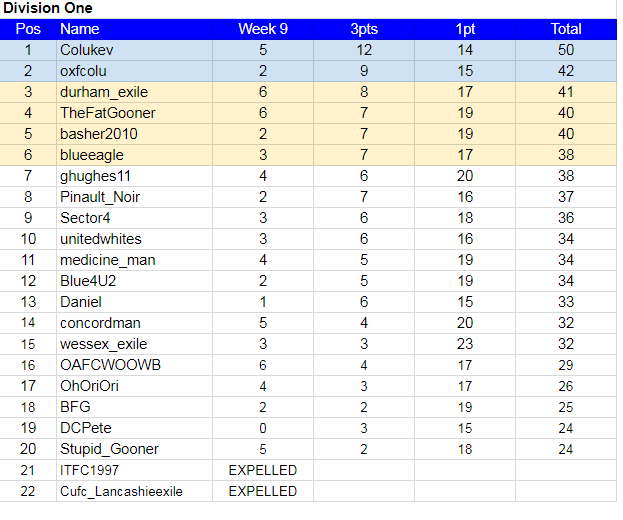 The top scoring efforts from durham_exile and TheFatGooner moves them both up three places into third and fourth respectively. After moving up five places last week Pinault_Noir drops that same number this week. With only 6 points separating 6th to 15th, there are likely to be many more big rises and falls before the season end. A welcome 3 pointer for Stupid_Gooner with the Sunderland 2-1, but he now occupies the wooden spoon spot after ITFC1997 became the second one to be expelled from this league. Week 10 Fixtures It is time for another International break, so this weeks guest Pinault_Noir has picked ten which are "personal" to him on his moves around over the years. DON'T FORGET THE DEADLINE THIS WEEK IS 14.00 If you are too late for the Northampton v Forest Green game still predict the other 9 fixtures before 15.00 please. Bloomin heck Pinault you have done a lot of moving around!